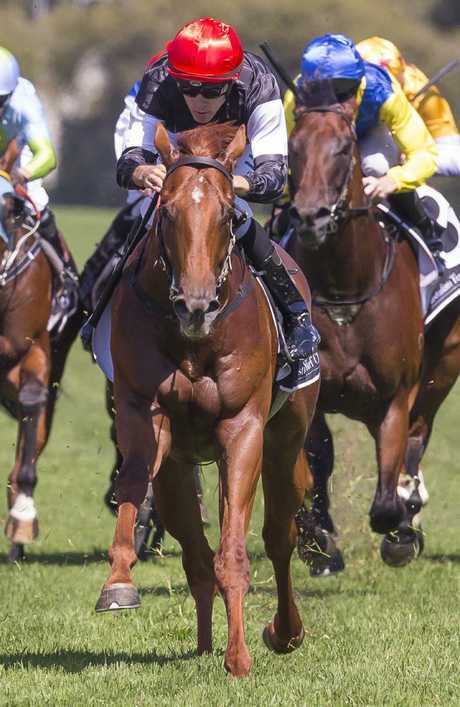 THE broodmare was purchased for just $3000, her colt was passed in as a yearling, the youngster's full-brother lost his life in a paddock accident, the trainer is on the comeback trail after walking away from the sport for two years, and the owner is one of the last living links to the great Todman. This is a snapshot of the Written By story which is set to add another remarkable chapter to the rich history of the $3.5 million Longines Golden Slipper (1200m) at Rosehill Gardens on Saturday. Written By is bred and owned by Hall of Famer Neville Begg and trained by his son, Grahame. Unbeaten in four starts including the Blue Diamond Stakes and Pago Pago Stakes, Written By is challenging for Slipper favouritism at $4.80 behind Sunlight ($4.20). 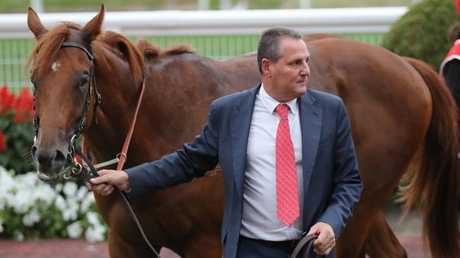 "This colt has done a fantastic job,'' Neville Begg said. "He's won a Preview, the Blue Diamond and Pago Pago Stakes in just four starts. That's a big effort. "I think he has done a lot in a short space of time but there are some very good horses in this race. Written By is Grahame Begg's first Golden Slipper runner since he prepared the colt's sire, Written Tycoon to finish down the track behind Stratum in the race's 2005 renewal. Begg said a wide barrier ruined Written Tycoon's Slipper bid. "He drew an outside gate (14) and it made it very tough for him,'' the trainer recalled. This is where Neville Begg comes back into the story. He was at the Scone Yearling and Broodmare Sale back in 2007 and took a liking to a grey mare called Yau Chin. She was no world-beater, in fact her only win was in a Newcastle maiden from 10 starts, but Begg could recall the mare racing competitively in the metropolitan area. "I wasn't sure if I should buy her so I have to give credit to (breeding expert) Les Young for his advice,'' Neville Begg said. "I asked him what he thought of the mare and he said she has a good and interesting pedigree and was worth a try. "I've known Les for a long time and I value his opinion. He sourced (champion mare) Emancipation for me out of a paddock as a yearling. Begg only needed a bid of $3000 to secure Yau Chin, who is by a Barathea, a noted sire of wet-trackers. Yau Chin's first three foals are all minor race winners but that changed when Begg sent the mare to Written Tycoon. The resultant foal was a chestnut colt that Begg liked so much he put a $200,000 reserve on him at the 2017 Melbourne Yearling Sales. When bidding stalled at $180,000, Begg decided to keep the colt. As Written By was developing into a powerful young horse and showing loads of potential, his dam produced a full-brother, a grey colt his breeder described a "very athletic". The foal was potentially worth a lot of money - then tragedy struck. "I went to see him in a paddock one day and a half-hour after I left I got a call that the colt had gone over a fence and broken his back,'' Begg said. Yau Chin has subsequently foaled a colt by Melbourne Cup winner Fiorente last spring. 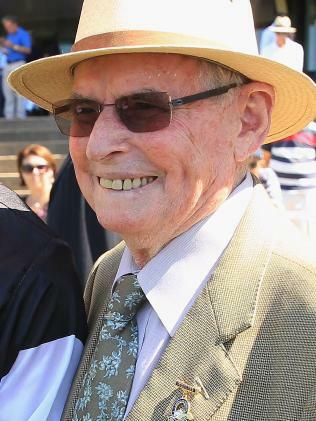 So, the shunned broodmare that Begg bought for a song has given the 87-year-old legend of Australian racing another chance at Golden Slipper glory on Saturday. Begg was stable foreman for Maurice McCarten, trainer of the sensational sprinter Todman, winner of the inaugural Golden Slipper by eight lengths. "Todman set an Australasian record at his very first start,'' Begg said. Begg recalled the Golden Slipper received good promotion that first year but he doubts anyone could have dreamt how quickly the race developed into the most important and prestigious juvenile event in world racing. A decade after Todman's win, Begg started training in his own right and in 1980, prepared Dark Eclipse to win the Golden Slipper. "I remember having a very good filly that year called Fiancee,'' he said. "She won the Gimcrack Stakes and the Silver Slipper early in the season and looked a very, very good filly. "But I don't think Fiancee was as good in autumn as she was in spring because she ran unplaced in the Golden Slipper then later that year came back to win the Flight Stakes. The quick back-up into the Golden Slipper was once accepted practice but hasn't produced a winner since Crystal Lily in 2010. Grahame Begg is going back to the future with Written By. Begg had to start Written By in the Pago Pago Stakes last Saturday after a scheduled barrier trial was called off due to wet weather. 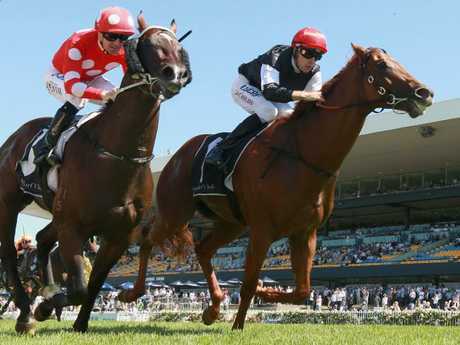 The trainer believes the race has been beneficial for his colt's Slipper chances. 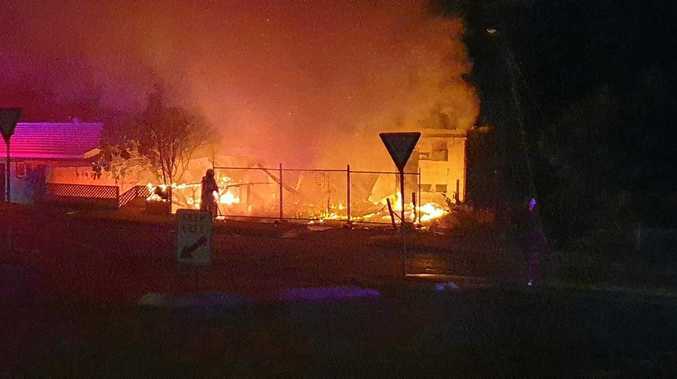 "He needed the run,'' Begg said. 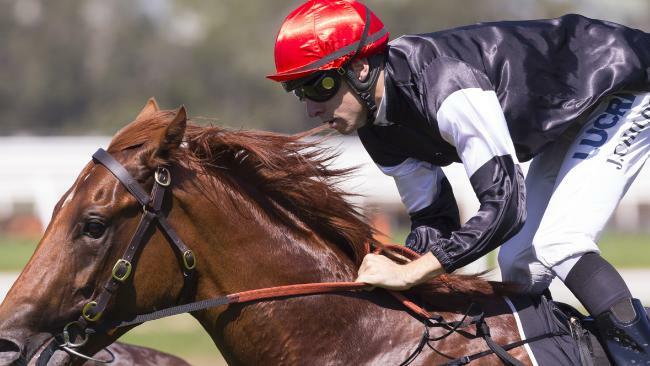 "He hadn't raced since the Blue Diamond so it has definitely brought him on. "This will be a high pressure race, there is speed inside and outside. From barrier four, Jordan (Childs) gets the opportunity to ride a good race. From a wide barrier you don't get many opportunities, you need to make a quick decision and live by it. Written By is usually a brilliant beginner from the barriers but surprised Begg when he wasn't as fast away as normal last Saturday. "In the Blue Diamond he 'shanghaied' out of the gates but in the Pago Pago wasn't so quick away,'' the trainer said. Trainers often talk about identifying juvenile talent very early in the season and Written By was no different, according to Begg. "If they are naturals, they show it from day one and this bloke certainly did,'' Begg recalled. Begg could sense Written By's emerging potential but was reluctant to place too big a boom on the colt. As Written By has kept winning, Begg's resurgence as a trainer has gathered momentum this autumn. Begg had been leading Sydney training since 1990, preparing so many top class gallopers including All Silent, Bonanova, Eye Of The Sky, Ilovethiscity, Mahaya, Monopolize, Our Egyptian Raine, Secret Admirer and Whisked before suddenly quitting the training ranks in late 2014. Written By can add the Golden Slipper to his impressive unbeaten run on Saturday. He spent a couple of years pursuing other interests but the lure of the thoroughbred proved irresistible and he has set up a new training base at Pinecliff, a private training facility on the Mornington Peninsula. "I needed a new challenge,'' Begg said. "I feel re-energised after the break I had away from training. "At Pinecliff, it is a very different environment and I had to learn to train off the property. But we get to work when we want to work and have very good grass tracks. Begg has built his team back up, having 20 in work and 40 on his books, and has certainly regained his enthusiasm for the sport. 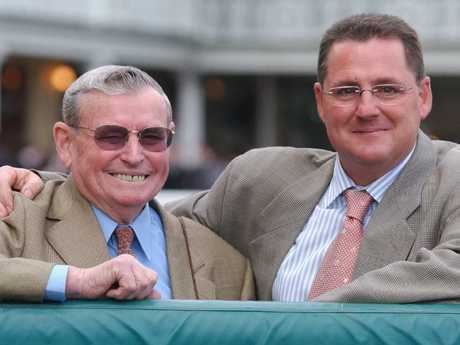 Sydney training dynasty: Graeme Begg (right) with his father, former trainer Neville Begg back in 2004. His father admitted he was worried when his son retired from training four years ago. "I think it got to the stage where it was getting all too much for him,'' Begg said. "Unless you have a big team of horses and a lot of clients, it is very tough in Sydney racing and Grahame decided to take a break from it all. "I was concerned at the time but in the long run it has been the best thing for him. Both father and son also agree this is going to be one of the most enthralling renewals of the Golden Slipper in years. Grahame Begg said Sunlight deserves to be favourite but described the Slipper field as a "deep race". "I can't believe some people have been criticising the form because the good two-year-olds have kept winning,'' the trainer said. "But win, lose or draw, Written By has done a marvellous job. He's very resilient, he never takes his head out of the feed bin and up until now he just gets the job done. 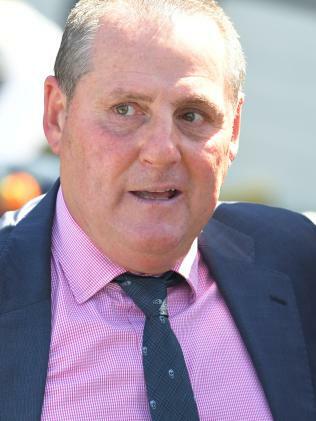 As the hype and media attention on the Golden Slipper intensified this week, Neville Begg has had reason to pause and reflect on his record in the race over more than 60 years from Todman through to Written By. "It's a great race and I'm excited to have an interest in the Slipper again,'' Neville Begg said. "Grahame has done a great job preparing Written By and we are in the race with a good chance. "Grahame and I talk often, almost daily, about plans for the colt but I don't get involved with the training of the horses. He knows what he is doing, he's a very good trainer.